Brands like Susanne Kaufmann have paved the movement of natural cosmetics. To its founder, this means more than just creating effective products; it’s a lifestyle. From the rooftop terrace of her Bezau home, Susanne Kaufmann gazes at the neighboring landscape. A mix of traditional Alpine farmhouses and modern timber structures blend into vast green, hiking trails, and dense forests. Church bells ring intermittently, cows graze on the open meadows. The historical village of Bezau in Austria’s Bregenzerwald seems unassuming at first glance, yet it’s rich in cultural diversity. Against this scenic backdrop, family-run businesses feel as natural as their environment, Hotel Post, a local household name helmed by Kaufmann since 1994 (before that it was run by her parents), being no exception. The hotel and its adjacent spa were the birthplace of Kaufmann’s eponymous brand that has ethically produced natural skincare for fifteen years. Regardless of how sought after her products are on international markets, Bezau remains the company’s base overseeing both operation and product development. 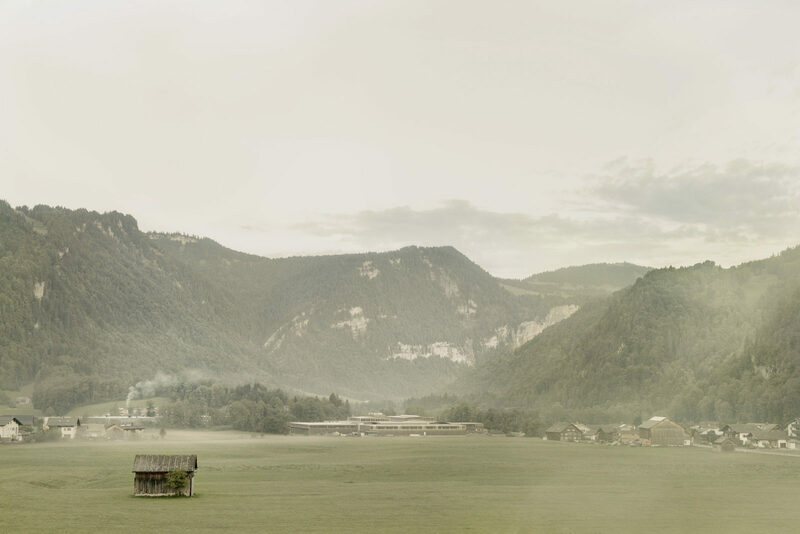 The Bregenzerwald region is renowned for its progressive approach to woodwork, pioneered by a group of architects in the '70s, Kaufmann's father Leopold Kaufmann being one of them. Reports show that the global market value of organic beauty will rise to approximately $22 billion by 2024. In 2017, the estimate was roughly $15 billion; a decade earlier, it was less than half of that amount. While the booming industry has aspiring and established business owners increasingly jumping on the organic beauty bandwagon, the figures are indicative of how our society is becoming more health conscious and, as a result, demands more clean-label products. Customers want to buy into concepts with detailed documentations on philosophies and processes—reassurance of knowing both ingredients and processing are as pure as possible. Hotel Post includes the first Susanne Kaufmann Spa, which only utilizes Susanne Kaufmann products. Born and raised in the Alpine village, surrounded by a close-knit community that prides itself on self-sustainability and a deep kinship with nature, Kaufmann always cherished the “rural region’s very modern aspect.” Her father was the architect Leopold Kaufmann, a pioneer in wood construction in the Bregenzerwald in the ‘70s whose intricate designs were dedicated to the region’s rich traditions in woodwork. “We are deeply rooted, but very open-minded and eager to collaboratively create things that are state-of-the-art,” she notes. To retain the plant extracts’ potent bioactive properties, Metzler and his team use cold-press extraction, a technology that omits solvents and only requires low temperatures. Additionally, all products come in recyclable glass and with hand-ticketed labels, made in Metzler’s solar-powered workspace adjacent to a unique wooden storage hall. The space is part of the Bezau experience: Hotel guests are invited to see the processes, meet the people that are involved and have been trained here—be it in the production, the spa, or the hotel—and follow the footsteps of every green source. “We could never communicate this through slogans or posters,” Kaufmann says. Susanne Kaufmann and Ingo Metzler who has worked as a natural cosmetics producer for three decades. Susanne Kaufmann is the head of the natural cosmetics brand Susanne Kaufmann and Hotel Post in Bezau, Austria. Next year, both brands will ultimately merge, inviting people to the very origin of Kaufmann’s fruits to escape their daily lives for therapy sessions that include yoga, facial and body treatments, healthy eating, hiking, and more. Every product of Kaufmann’s eponymous lines, which are available for men and women, is developed and produced in the region before being distributed worldwide.